Absorbed in the images before me, I visualize my success. The page before me has on it the curled corners of magazine cutouts, stickers with encouraging phrases, descriptions of my future, and images I’ve printed with inspiring quotes. Today, I focus solely on my professional visions. Establishing a reputation in my field that allows the flexibility I seek. I visualize myself working abroad. Working with my child by my side. Working with individuals seeking similar futures in various fields. 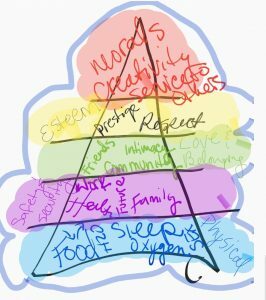 Working with vulnerable populations of people who are often barely reaching the lowest tier of Maslow’s hierarchy of needs. I am the change for my clients. I am an inspiration for my peers, clients, and coworkers. I envision my mentors throughout my life showing me the way. Creating a vision that puts me in the mentor position. Dreaming of a life that touches others the way I’ve been influenced throughout my life. Empowering others as I’ve been empowered. It’s difficult at times to visualize these things to the magnitude I have done today. This is the purpose of my vision board. I know many who create their vision board, then do not use it. 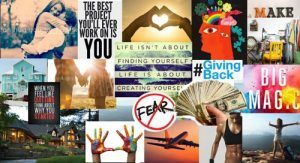 To use a vision board is to create the images, words, and feelings that you would have to achieve your goals if money were no object. 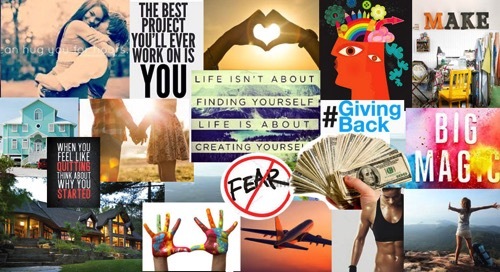 The vision board should resonate with your current purpose. It should be an agent that assists with meditation for a specific or broad set of goals. Today, my vision board is fairly sparse, but it serves its purpose. I look at my vision daily and adjust as my heart desires. Today, my focus is empowering others, doing what I love, and recognizing that the beautiful life I desire is a journey, not an overnight miracle. The work is a daily process and the daily meditation on the topics I’ve included is a part of that journey. As my goals change, so will the images I choose to use for my visual stimulation. For anyone wishing to use visual representation to assist with the meditation process first choose an area of focus. This can be as specific as career oriented growth as I’ve done, or it can encompass the collage of topics that include spiritual, family, career, school, health, personal growth, financial stability, travel, and social life. The emphasis can overlap or it can be separated, although I find that when narrowing the topic other areas find their ways in. What does your life look like if money and resources are not a barrier in these areas? 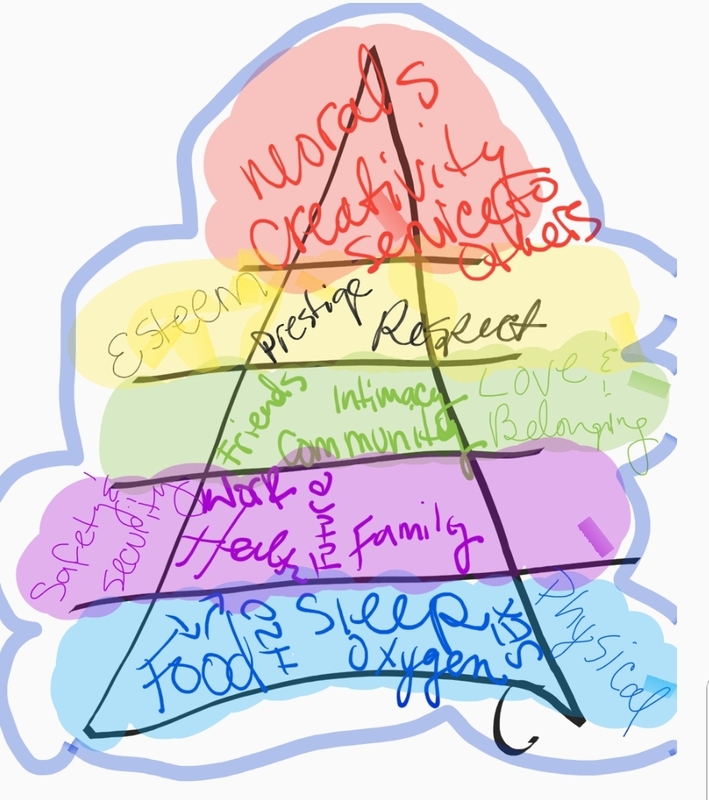 What character traits would you like to be known for? What have you always wanted to do, but have never had the courage to do? Flow through these question for each topic and you’ll find yourself dreaming bigger than you might ordinarily. These visions of grandeur are an important part of building successes in your life. Building the vision without revisiting it, working for it, or changing it as areas become obsolete in your core is like visualizing the perfect meal and never creating it. Never going through the ingredients list, but never putting in the trip to the store. The perfect homemade loaf of bread did not bake itself. Nor did it gather the ingredients for its own fruition. Visualize. Meditate. Overcome the barriers you come across, and make it happen in your life. If you can think it, you can do it.